The amusingly titled animated movie Interstella 5555: The 5tory of the 5ecret 5tar 5ystem is a rather singular achievement. 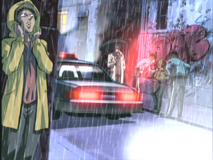 On paper, a long form music video from the laudable dance music duo Daft Punk, but in practice much more, the sixty-five minute anime delivers an exciting fusion of modern pop music and modern pop moviemaking techniques. Conceived at the same time as their “Discovery” LP, Daft Punk’s grand experiment exhibits the astonishing incorporation of a set of tracks that might not outwardly seem a good fit for such treatment. One certainly has to give the scenarists bonus points for not only managing to work in visual touchstones for the robotic sounds of “Harder, Better, Faster, Stronger” but also making its lyrics relevant. There’s not a dull moment here, since even the lesser tracks from “Discovery” are strengthened by the visualization. With surprising substance and without edits always falling on the fourth beat, the gambit works, resulting in a futurist Fantasia (that incidentally beats the pants off of Disney’s own Fantasia 2000), that simultaneously recalls the similarly ambitious experiment of Pink Floyd’s The Wall. Like any film that is so dependent on music to tell its story, it has obvious applications as a head-trip enhancer. What’s so impressive, though, is how rarely it feels like a laser light show timed to the group’s music. Although the visuals are endlessly inventive and open to just about anything as a reference point, the movie contains a definite progression of character and plot that ensures the spectacle doesn’t wear out its welcome. The plot, such as it is, follows a blue-skinned alien rock band as they are kidnapped, disguised as humans, brought to Earth, and enslaved by an evil manager, who plans to use their success in his bid to control the universe. One is tempted to read into this almost clichéd tale of a record company that whitewashes and repackages talent for its own gain, but I think it’s intended less as pointed satire than a spirited recounting of one of the axiomatic rock legends. By necessity, the movie has been conceived in purely cinematic terms, so all of the storytelling is done visually. The exemplary character designs come courtesy of famed animator Leiji Matsumoto (of Star Blazers fame), who uses his lifetime of experience to create a range of drawn emotions that more than make up for the lack of spoken words. Better still, even though there’s a strong emotional component to this simple story, the tale never grows so self-serious that it stops functioning as the perfect conduit to deliver Daft Punk’s club-ready tunes. 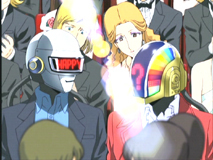 It obviously will help matters if one is, like me, predisposed to Daft Punk’s music (which lies somewhere between prog-rock, house, and disco), but I hardly think a general indifference to it would keep a viewer from enjoying what is one of the most streamlined, breakneck animes I’ve ever seen. Coming out, as it has, over two years after the release of the album that inspired it, it’s almost impossible to see Interstella 5555 as a cynical attempt to cash in on the band’s stature. In fact, the quality of this film is such that I hope that this is the start of a new trend for a music industry searching for new revenue streams in the Internet age (I do remember hearing rumblings that the band Gorillaz had a similar project in the works…). As it stands, Interstella 5555 is, with the possible exception of Disney’s short Destino, the best animated film made in 2003, and a true testament to the artistry possible in two very different mediums.